Day 3 of card making tutorials. 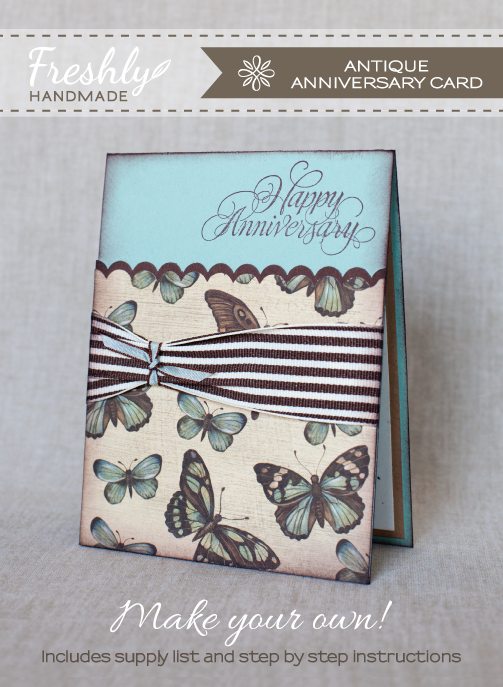 Today, I am sharing how to make this beautiful, antique-looking anniversary card. I really like the natural feel that it has as well. 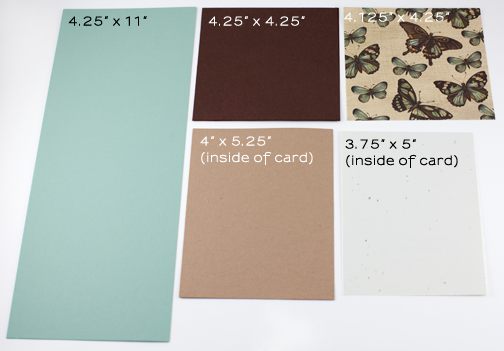 Step 1: With the aqua card stock, score a line at 5.5" down the middle of the sheet. Fold card in half along score line. 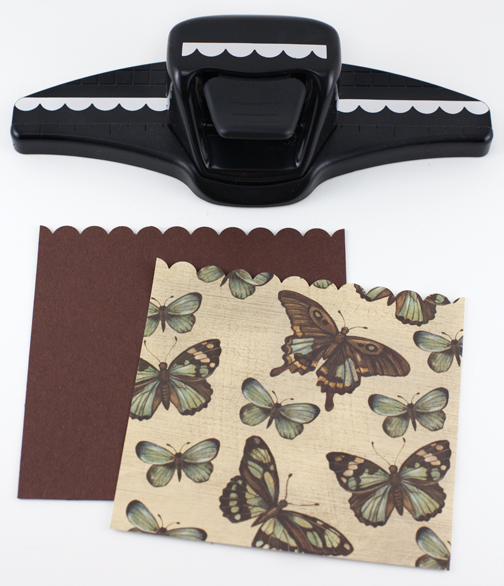 Step 2: On both the dark brown card stock and the decorative paper, use the scallop edge punch along the top. 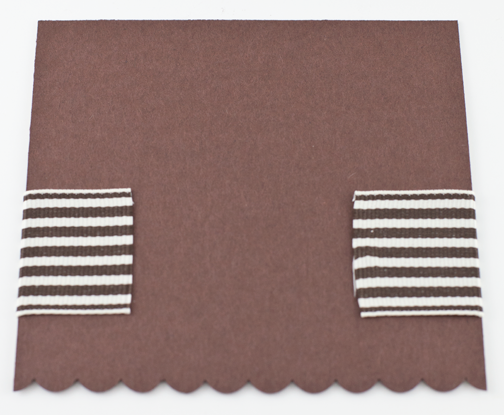 For the decorative paper, make sure it is first oriented to be 4-1/4" W x 4-1/8" H.
Step 3: Apply double stick tape to the back of the decorative paper and adhere to the dark brown card stock, aligning the straight edges on the bottom and sides. 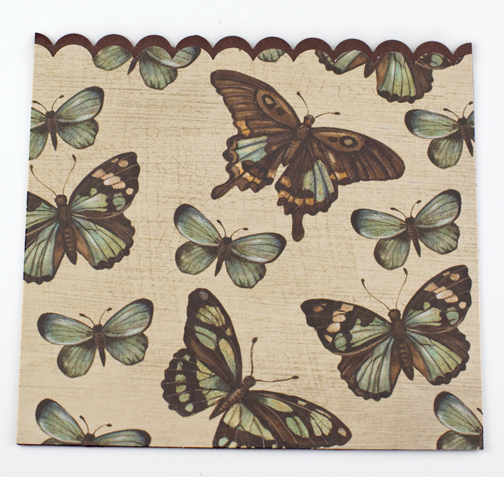 Step 4: Take the 1-1/2" wide ribbon and lay it across the front of the decorative paper. Apply double stick tape to only the right side of the ribbon. Step 5: Flip the ribbon over to adhere it to the front of the paper about 1" down from the top of the brown scallops. Now, flip the paper over toward you. Step 6: Apply double stick tape to the back to adhere the ribbon flaps. 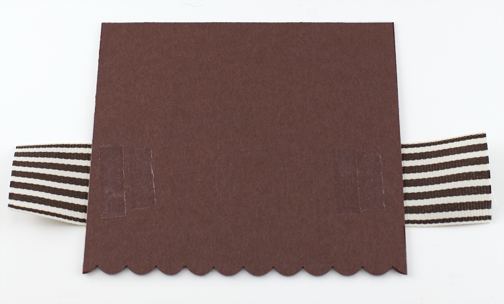 Step 7: Apply double stick tape along the edges of the brown card stock, generously where the ribbon lies. Apply this to the front of the aqua card stock aligning the straight edges of the bottom and sides. 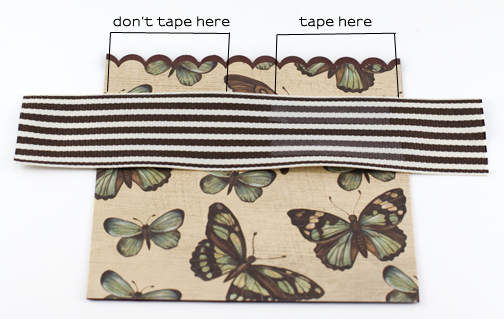 Step 8: Take the 3/8" wide ribbon and slide it under the thicker ribbon on the left-hand side. 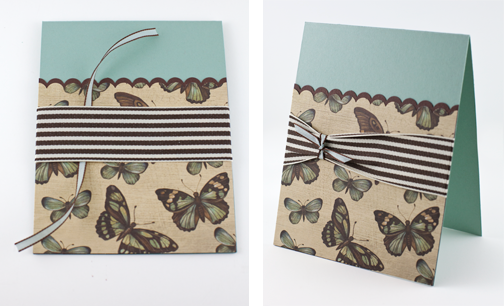 Tie the thin ribbon into a knot creating a slight pucker in the thicker ribbon. Trim ribbon ends on an angle. 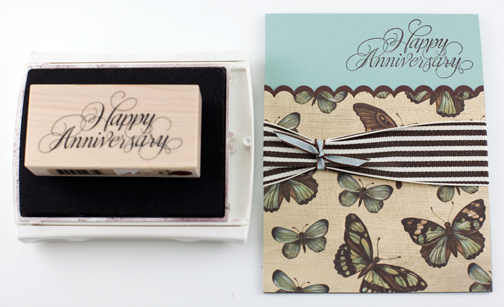 Step 9: Apply your sentiment along the right edge on the aqua card stock with your rubber stamp and ink. 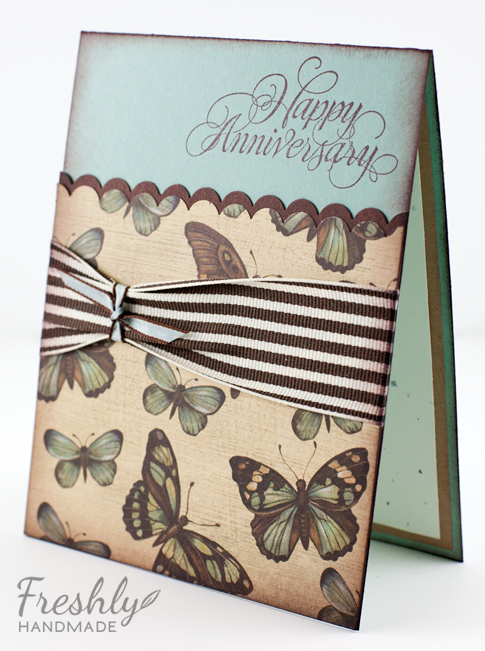 Step 10: Next, you're going to create the antique effect along the edges of the card. To do so, take the small sponge and blot it on the ink several times. 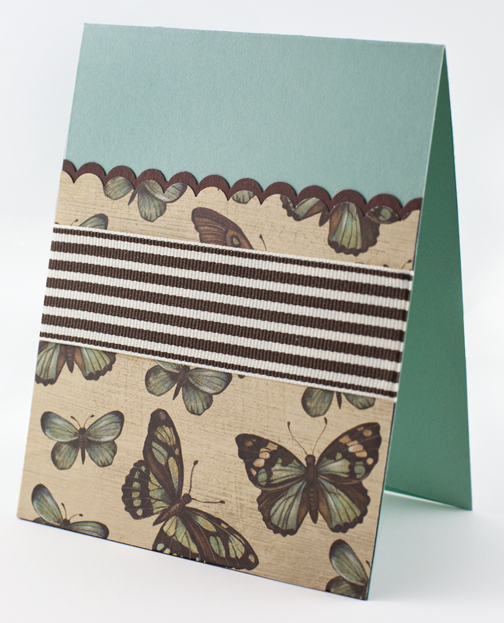 Step 11: Flick it along the edges from the top of the card toward the back at a 45 degree angle. 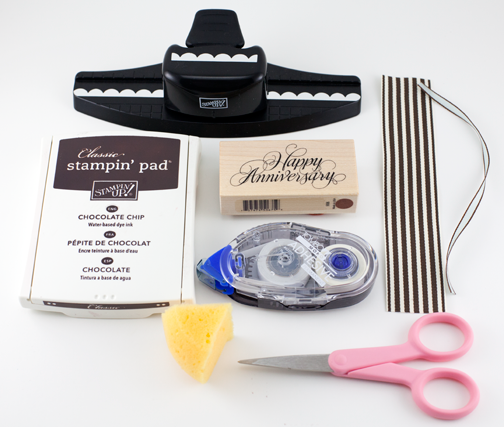 Do this along every edge, even over the ribbon. Step 12: Layer and adhere the 4" x 5-1/4" craft card stock and the 3-3/4" x 5" white card stock on the inside to finish off the card. That's it! I hope you get a chance to make a similar version for someone special.